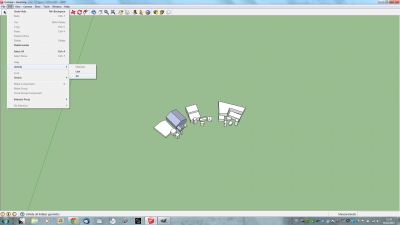 Making 2D maps come alive using SketchUp | Rollespræll! 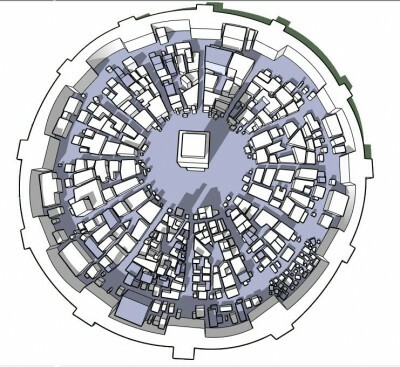 After posting some maps of Ismam, the desert city on reddit, someone asked how they were made. So here is short guide on how to get started transferring 2D drawings into a more lifelike version. In this guide, I’m going to use my map of a town called Cogburgh. 2. Zoom out until the little human is quite tiny. 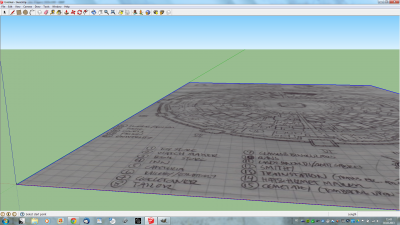 This is to make room for the map which will be placed down and then stretched out. 3. Import the image file you want to use. In this case, I’m using my Cogburgh map. 4. Place the map in the corner and then stretch it out quite a bit. 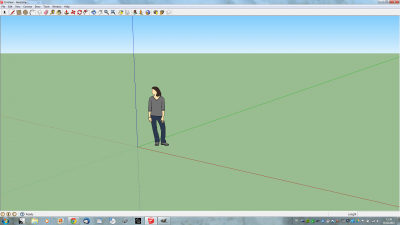 Here I have stretched it way too much, as you can see by the large grids compared to the near invisible human. 5. Since I don’t want buildings the size of mountains, I decided to scale down the map a bit. 6. 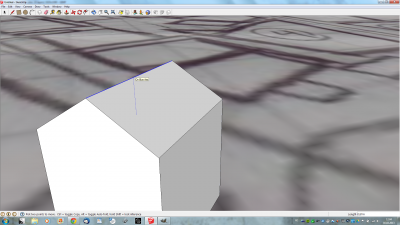 Using the line tool to check my dimensions. 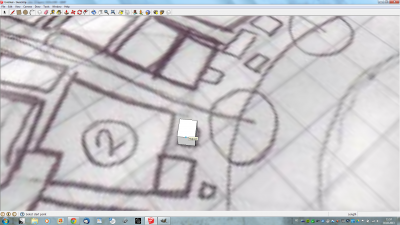 A look at the numbers to the bottom right of the screen tells me that my grids are 8,79m. That’s close enough for me. 7. 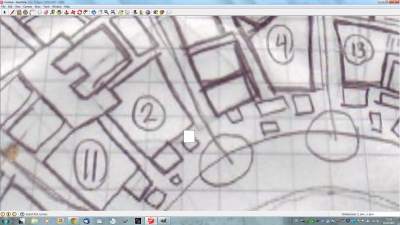 The quick and easy way to get started is to use the line tool to follow the outlines of the buildings. Note that once you complete a figure, it turns white and covers your drawing. So work outwards, if you know what I mean. 8. 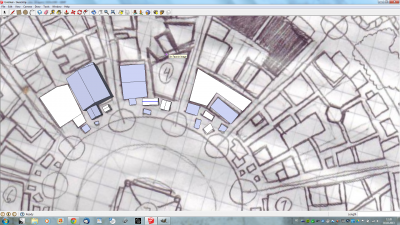 Then there is the OCD way of making buildings. Although it is quite time consuming, it is also the best way, since your structures will be WAY much better off in the end (especially when the time comes to make roofs. 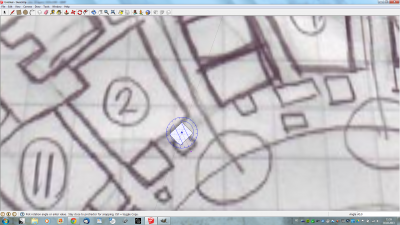 Here you use the rectangle tool to make a square/rectangle about the same size as the one on your map. As you can clearly see, the placement and rotation is way off. So – let’s take the time to fix that. 9. First I have to mark it using the marking tool (the arrow). If I don’t, anything can (and will) happen. 10. Using the orientation tool. Click the marked area (twice if I remember correctly) and start moving your mouse. Look at the magic. Click your mouse once you are satisfied with looking at it spinning round and round. 11. And with the move tool, we move it in place. Look, it’s a perfect fit, and it only took 5 minutes! 12. Using the elevation tool, you click your little square and type in a number on your keyboard, then hit Enter. I chose the number 3. 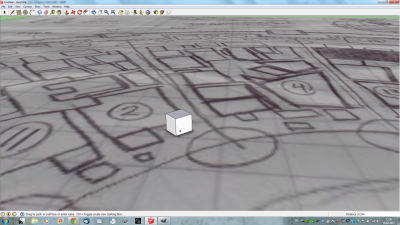 And my square turned into a cube 3m high. You can elevate it manually, but it’s difficult to get precise numbers. 13. Time to start making a roof. 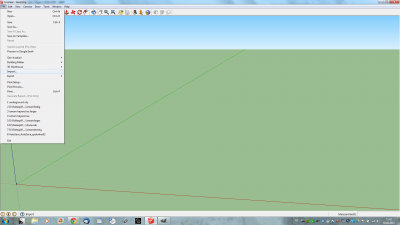 Use the line tool, try to find the midpoint. 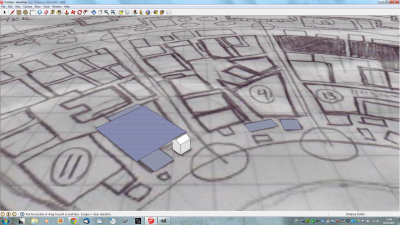 SketchUp will let you know once you locate it. 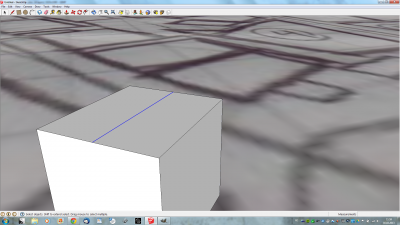 Click it and draw a line to the midpoint on the other side of the top of your cube. 14. 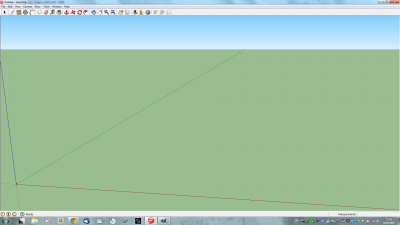 Once that is done, use the selcetion tool (the arrow) and mark the line. 15. Now use the move tool again to move your selected line upwards. 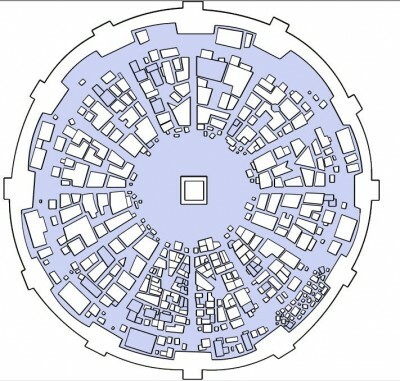 Make sure you do not stray from the blue axis (unless you like weird houses). 16. 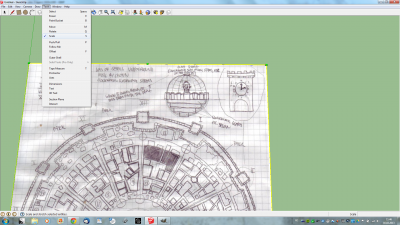 Using these guildlines, you can start working on the rest of the city. 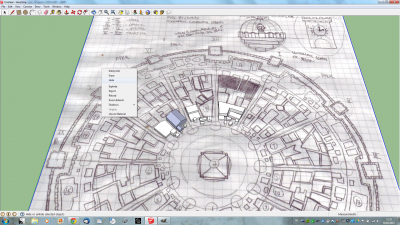 Mind you, it’s going to take hours and hours and hours and days if your map has more than a handful of houses on it. 17. Oh God, this is going to take forever. 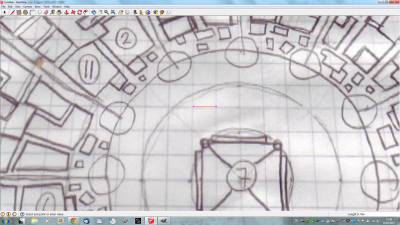 Let’s go back to the quick way, where we just use the line tool to make shapes. 18. 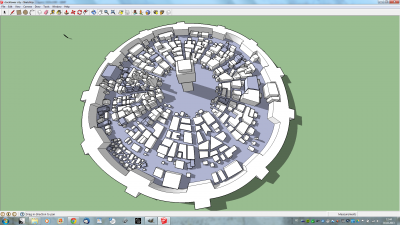 Way easier and much faster, but you can forget about making roofs (feel free to try anyway, though). 19. This is why you want to type in a number when you elevate your squares. Whenever you doubleclick on a top surface, it will automatically elevate your designed number. So the houses jump up in no time, and it’s easy to make them several stories high. Btw, why are some of the houses grey? Probably because I did something wrong somewhere. Not quite sure exactly what I did wrong, but grey houses is a great way of knowing you’ve messed up somehow. 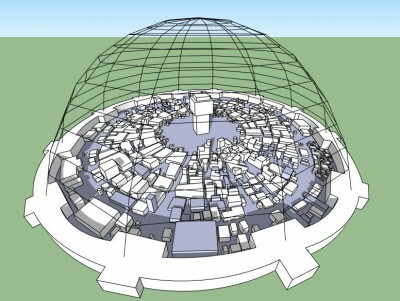 Anyhow, let’s just stick to flat roofs from now. 20. As you can see, there’s a lot of work to be done still. But just keep going and before you know it, your kids have moved out and your map is done. 21. Here the old map is hidden. but the surface is some kind of green (?). 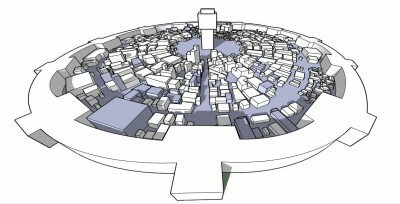 To make a white surface, just create a gigantic rectangle/whatever around your whole city once you are done. 22. And of course, I’ve cheated a bit. I made this map quite some time ago, but here’s how it turned out. Not too great, but not horrible. 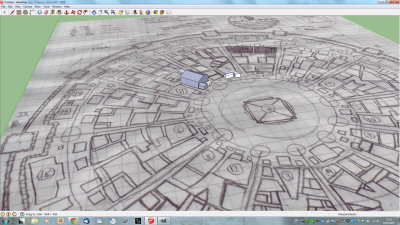 And the better your original map is, the better your 3D version will be, too.